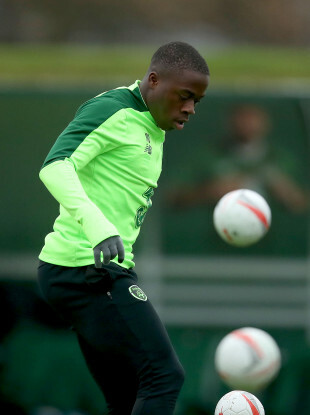 Michael Obafemi pictured during Ireland training. MARTIN O’NEILL SAYS that Southampton teenager Michael Obafemi is unlikely to feature in the upcoming Nations League match against Denmark. The 18-year-old, who is also eligible to play for Nigeria and England, is currently contemplating his international future. Obafemi could play in Thursday’s match against Northern Ireland, though O’Neill said he was unlikely to feature in the clash with Denmark on Monday, having talked to the youngster. Featuring in the Danish match, which counts as a competitive game, would tie Obafemi down to the Irish team for the remainder of his career. “I haven’t spoken to his parents, but I have spoken to him,” O’Neill said at today’s press conference. “He’s enjoyed the training, it’s been really good, and has done very well, very well in the training. Email “18-year-old Ireland striker unlikely to feature against Denmark as he considers international future”. Feedback on “18-year-old Ireland striker unlikely to feature against Denmark as he considers international future”.